It’s pretty cool, whether you’re a “bird person” or not, to catch a glimpse of a kingfisher. Maybe it’s because their outsized heads, squat bodies, stubby tails, and long, sharp bills lend them a whimsical Wind-in-the-Willows, storybook quality. Or maybe it’s that they don’t look like they should be very good at catching fish. So to see one perched on a reed or a too-small twig above a pond or creek, hopefully scanning the water below, is a subtle reminder that looks can be deceiving and are often a lesser virtue than persistence and attention. Besides all that, they are just plain beautiful, of course. Kingfishers are distributed widely across the globe and can be found on every continent except Antarctica. In fact, I saw two belted kingfishers just this morning buzzing around a pond near my house in Colorado. Many species do, as their names’ suggest, live near water and hunt for fish, though some live away from water and eat insects and other invertebrates. With ten resident species, Southern Africa boasts an embarrassment of kingfisher riches. 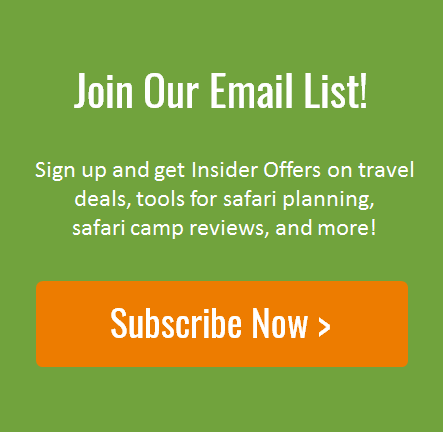 If you go on a safari in southern Africa, you’ll likely see at least a few of the species below. As its name implies, the giant kingfisher is Africa’s largest kingfisher species. It dives from its perch to catch crabs, fish, and frogs. The pied kingfisher is hard to miss thanks to it’s distinctive black and white coloration and its habit of gracefully hovering above the water before diving after a fish. It is found across much of Africa and parts of Asia. This jewel-colored kingfisher is often seen perched on reeds and small twigs near ponds and slow moving water. It hunts fish and aquatic insects and will beat its prey against a branch to subdue it. They are particularly abundant in Botswana’s Okavango Delta. 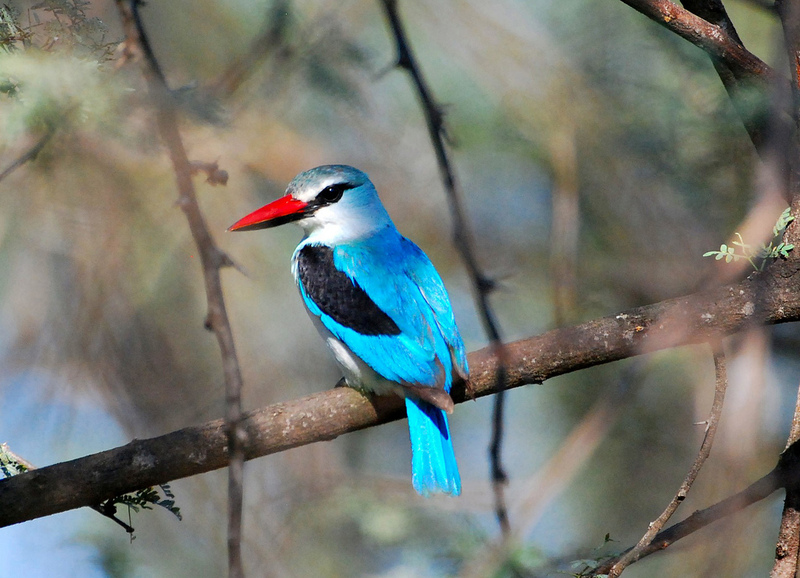 Brown-hooded kingfishers are widely distributed across Africa south of the Sahara. They mostly eat insects and prefer broadleaf woodland forests, though they have colonized city parks and suburban gardens. The grey-headed kingfisher looks similar to the brown-hooded kingfisher, but has a red bill instead of a black one. These guys live in dry woodland habitat and eat insects and small lizards. They nest in holes along riverbanks and can be surpisingly aggressive when it comes to protecting their nests. The half-collared kingfisher feeds exclusively on fish and can be found near water throughout southern and eastern Africa. This striking little bird is the smallest kingfisher in the region and is often mistaken for the larger malachite kingfisher. They nest in tunnels dug into sandy soil banks and eat mostly insects. The striped kingfisher is widely distributed through sub-Saharan Africa. It lives in open woodlands and grasslands and primarily eats insects (especially grasshoppers) and other invertebrates. Mangrove Kingfisher by Paul Barnard is licensed by CC BY-NC-ND 2.0. Mangrove kingfishers lives in coastal swamps and forests near coastal rivers along the east coast of Africa from South Africa up to Kenya. Woodland Kingfisher by Ian White is licensed by CC BY-ND 2.0. 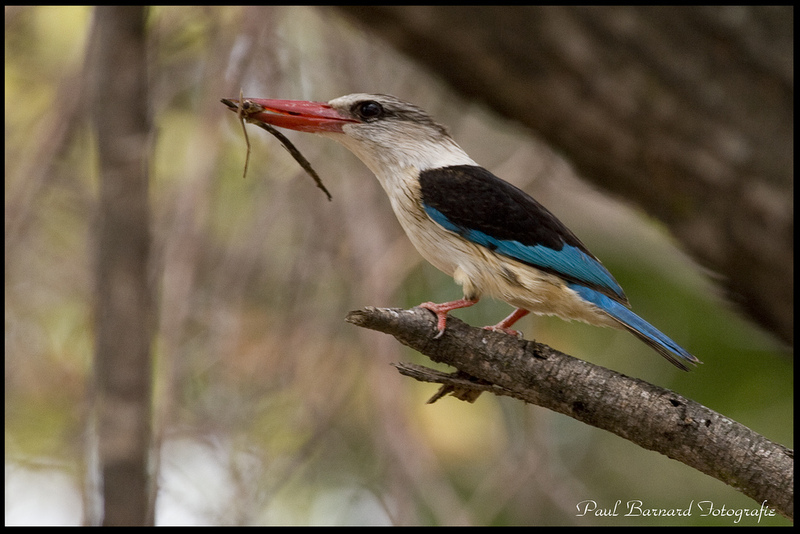 The woodland kingfisher looks similar to the mangrove kingfisher, but has a black lower mandible and a pale blue head. As its name implies, this beautiful bird prefers woodland habitat, especially acacia trees. They are extremely territorial and have even been know to attack humans.